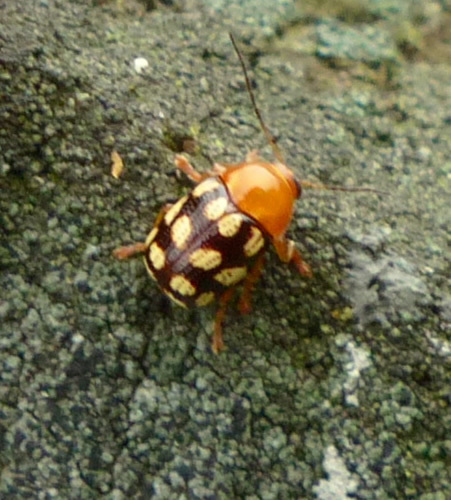 Comments: Count the spots and you’ll know how this beetle got its name. 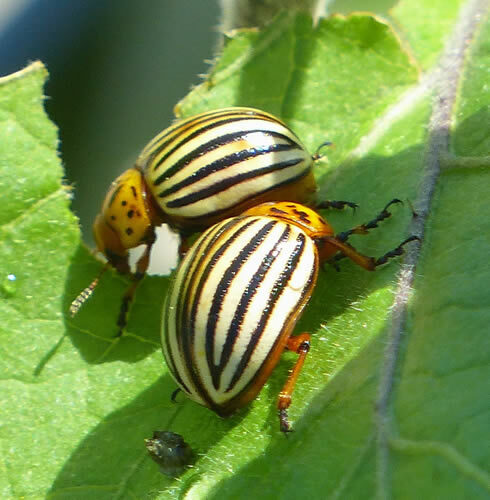 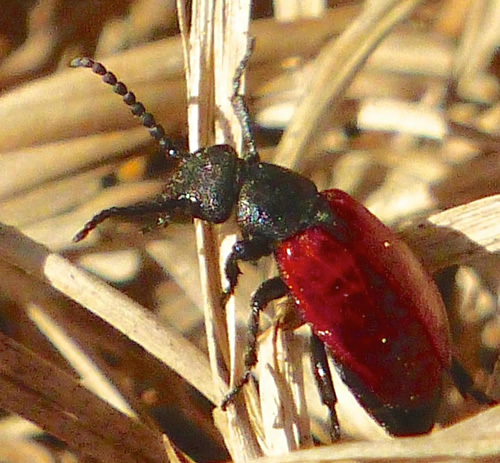 Comments: The Neponset River Watershed Association introduced these European beetles in Fowl Meadow in Canton and Norwood to control invasive purple loosestrife. 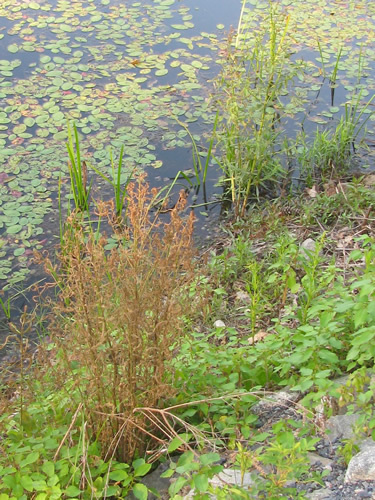 They have spread to Sharon, where they are having the desired effect of keeping the invasive purlple loosestrife in check so native plants can thrive. 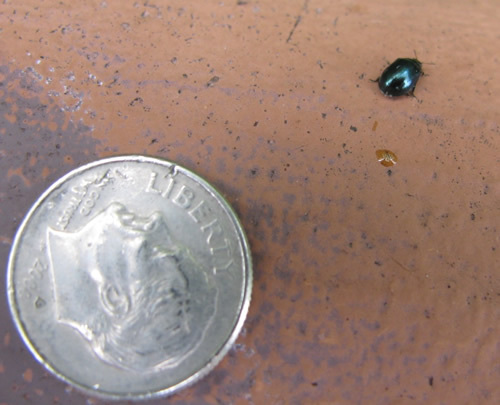 In upper left of the photo, you can see beetle eggs. 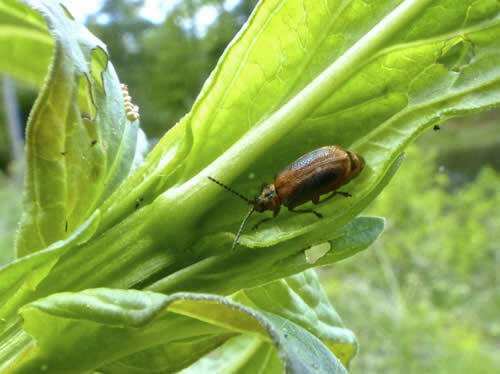 Comments: Galerucella beetles eat only purple loosestrife, an invasive exotic weed that has been displacing native wetland plants and reducing biodiversity. 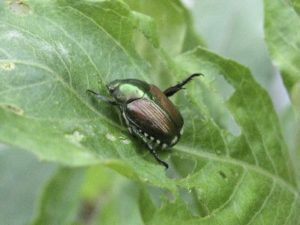 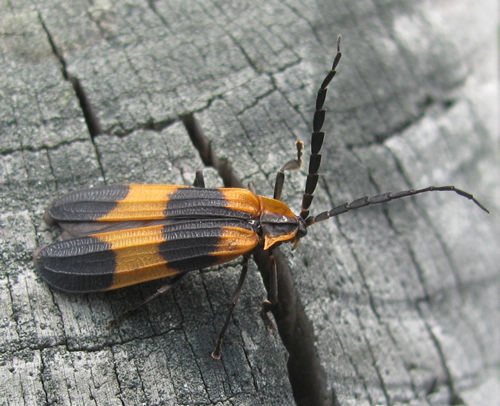 The Neponset River Watershed Association has been “ranching” and releasing Galerucella beetles, and they are now showing up in Sharon. Comments: Japanese beetles are not very destructive in their native Japan, where they are naturally controlled by indigenous predators, but in North America it is a noted pest of about 200 species of plants including rose bushes, grapes, hops, canna, crape myrtles, birch trees, linden trees, and others. 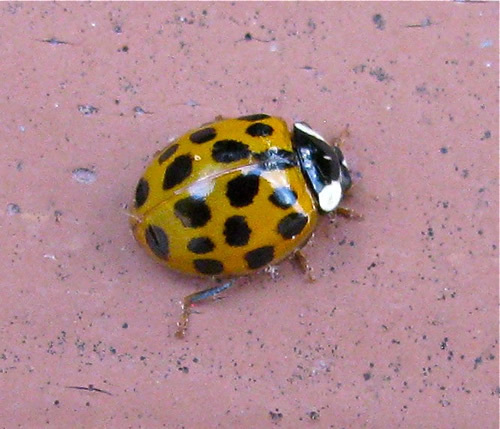 Comments: Multicolored Asian lady beetles come in different color patterns. Some, like this one, don’t have black spots. 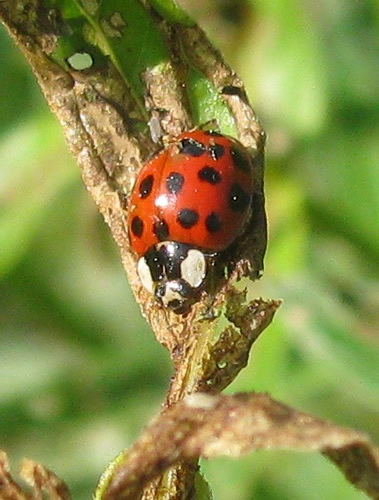 Comments: Lady beetles have variable coloration. 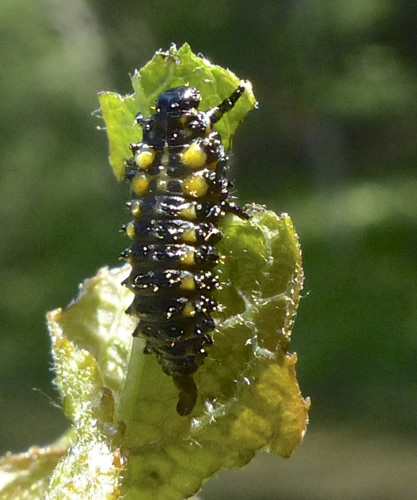 Comments: Lady beetle larvae don’t look much like the adults. 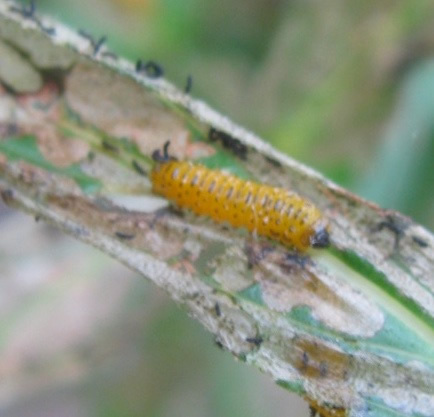 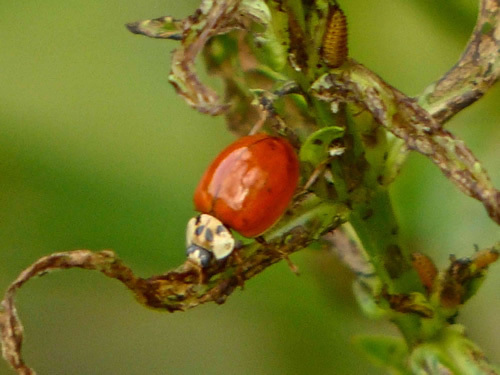 Lady beetles eat aphids, so they can be beneficial for agriculture. 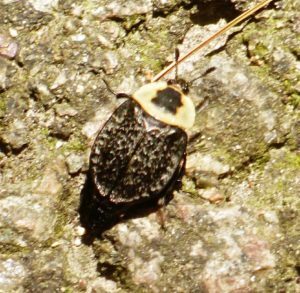 Comments: I spotted this beetle near locust trees. 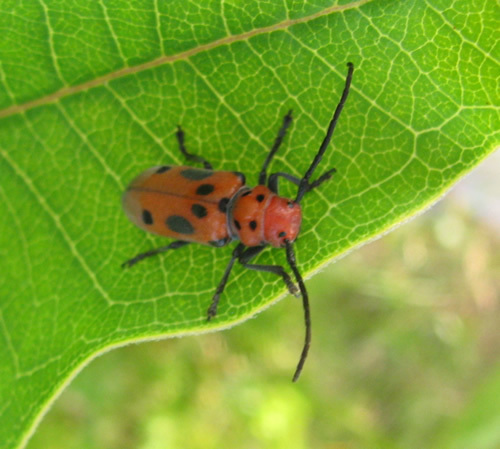 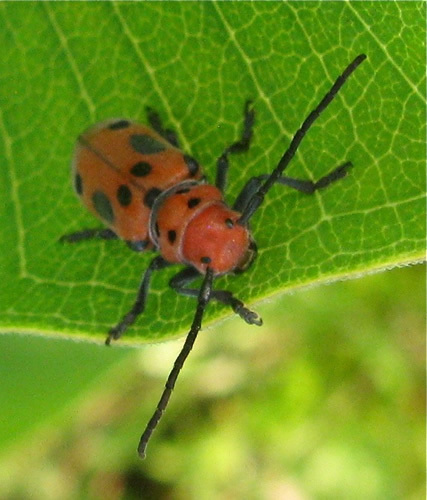 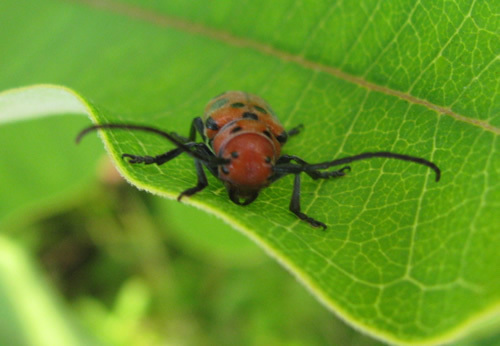 Comments: This striking red beetle was crawling on a milkweed leaf. 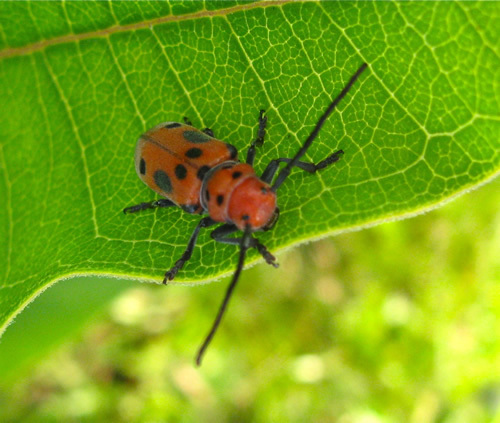 Its scientific name means “four eyes” because of its black spots that look like eyes. 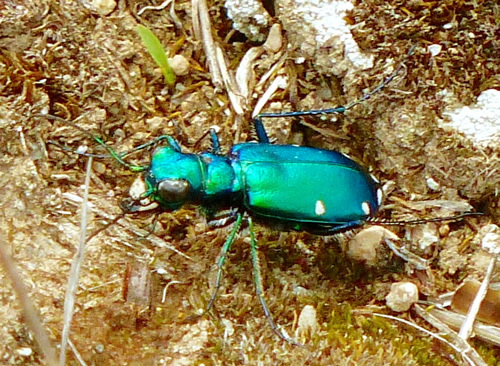 Comments: Female six-spotted tiger beetles lay eggs in sandy patches. 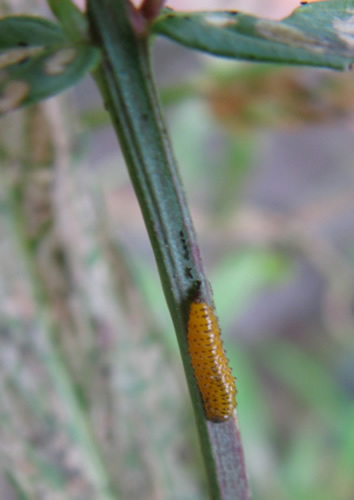 When they hatch, the larvae burrow into the ground. 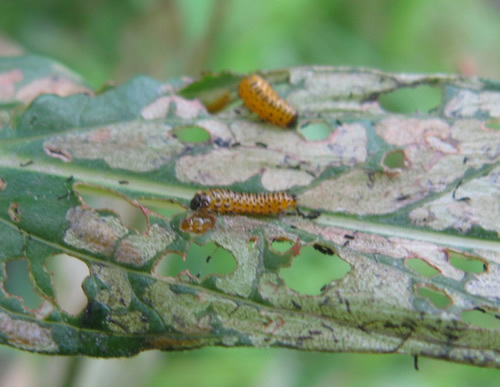 The larvae lie in wait until small arthropods walk by. 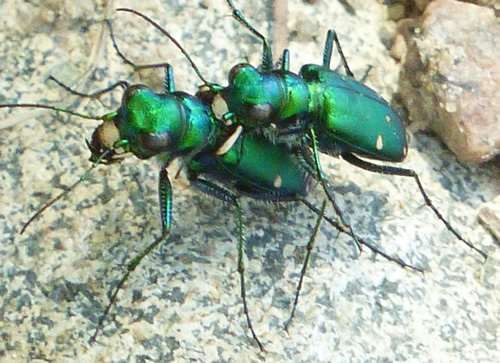 Then they pounce much like a jack in the box. 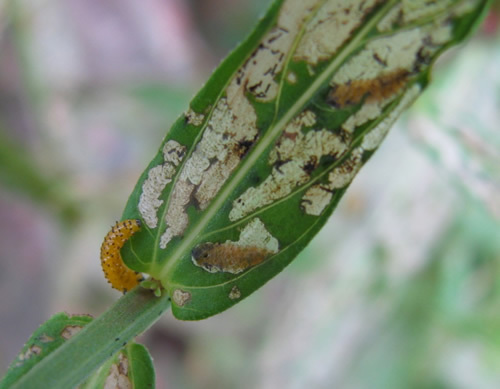 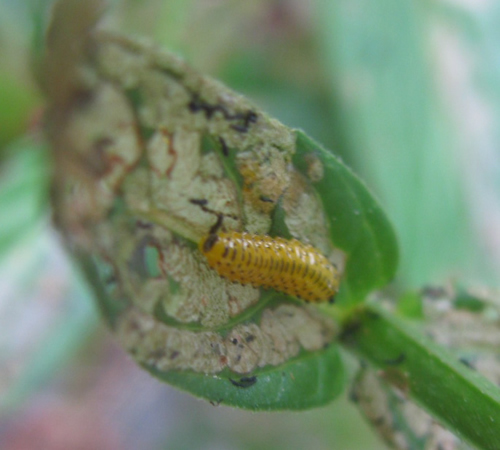 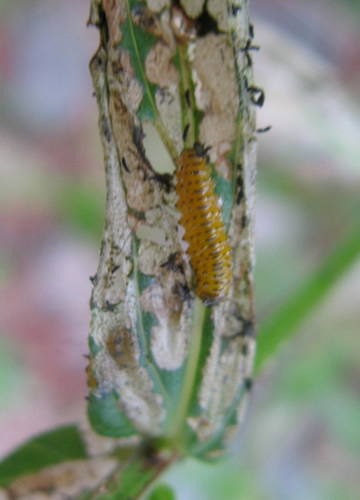 The larvae pupate after a year. 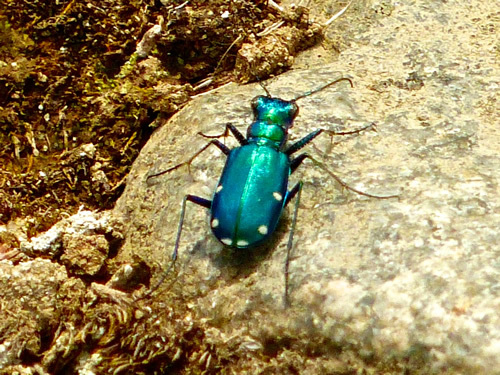 Six-spotted tiger beetles have a total lifespan of about five years. 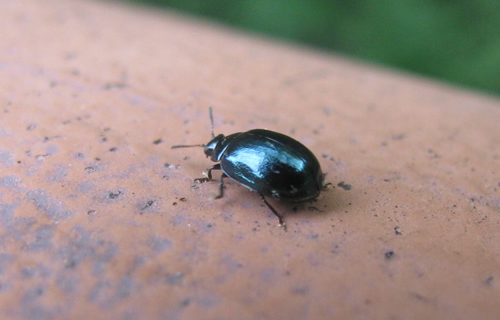 Comments: I got help identifying this tiny beetle at www.bugguide.net. 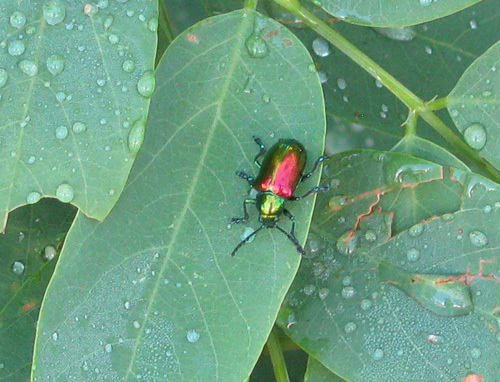 I set up a free account and uploaded my photo. 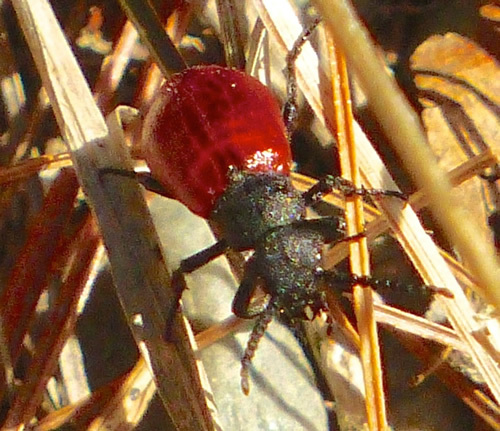 In a few days I received an email from one of their entomologists with the identification. 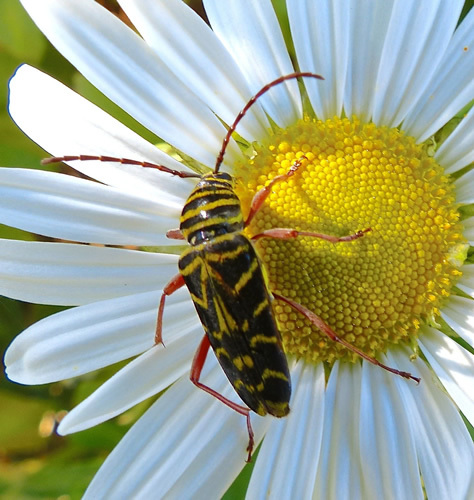 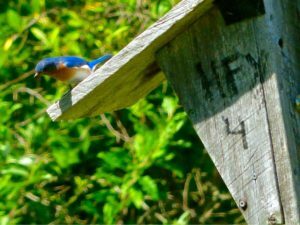 Given that there are thousands of species of insects, bugguide.net is a valuable resource for identification.